At various points surrounding the commercial complex. To commemorate the activities formerly carried out at HMS Vernon on Gunwharf there are several items of historical miltary hardware on display. Each is accompanied by an information board. This torpedo was designed for use by 'O' class submarines and motor torpedo boats. First entering service in 1927, they were extensively used during World War II, and were still in use until the mid-1980s. During the Falklands conflict, three were used against the Argentine cruiser ARA General Belgrano. The torpedoes weighed 1500kg, and included a high explosive warhead weighing 450kg, which would detonate on contact. It travelled towards a target at a speed of 45 knots. This torpedo could travel up to a maximum of 4500m, so from Portsmouth Harbour to Cosham, or an equivalent distance to 26 times the height of the Spinnaker Tower. 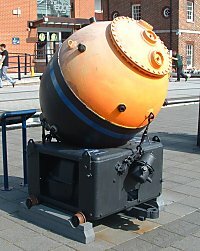 The Mk 17 Sea Mine is an underwater mine which is held at a calculated depth beneath the surface by a cable or chain mooring that is attached to a sinker that rests on the seabed. The mine could be used in two ways either as a Contact Mine or as an influence Mine. As a contact mine it had to make contact with the vessel while as an influence Mine it had to detect noise from the enemy ship causing it to detonate. It could be fitted with charges of up to 500lb. The Mk 17 Sinker was used to anchor moored mines in the sea at a precise depth. When laid, the Sinker falls to the seabed paying out the mooring wire until a pre-determined length is reached. The mine is then pulled down to its required depth and moored. At HMS Vernon, Naval Officers and Ratings were trained in all aspects of Mine Warfare, including the preparation and deployment of the Mk 17 Mine. During the Second World War, HMS Vernon became responsible for mine disposal and mine countermeasures. 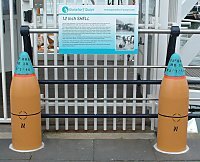 The HE (high Explosive) 12-inch shell was the main projectile fired by the big guns of British battleships from 1895, with gunpowder as the high pressure propellant. The shells weighed 850lbs with an effective range of five nautical miles, this is just over 9km - which as the crow flies is the distance from Gunwharf Quays to Hayling Island. The shells were fired with a muzzle velocity of 2,376 feet per second and were capable of piercing 33-inches of armour plating at 1,000 yards. The 12-inch shell was the most common ammunition fired by the Grand Fleet at the Battle of Jutland in 1916, the main naval battle of the First World War. The revolutionary big gun battleship HMS Dreadnought, launched here in Portsmouth in 1905, was armed with ten 12-inch guns which would have fired these shells. In making a single 12-inch gun, about 135 miles of steel ribbon was used and each time a 12-inch gun was discharged it cost the country about £100. The gunners which operated these guns were trained here in Portsmouth at the Naval Base on Whale Island. The Quick Fire, 12 Pounder, 3 Inch Gun was introduced into service in 1894 and used until the middle of the 20th century. It got its name from the 12 pound High Explosive shells it fired. The gun was fitted to RN Destroyers for use against surfaced submarines and on D and E class submarines for defence against air attack. 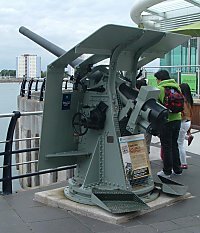 They were later used for defence in ports and harbours around the UK against possible attack by small fast vessels such as torpedo boats. The maximum range of the gun is 7 miles. The shells housed a cordite propellant, ignited by an electrically-activated primer with power provided by a battery.